These are just some of the Technologies that you’ll find inside our doors. If you’d like to learn more about the technologies we use, please contact us and schedule a visit. We’d be happy to show you how Limerick Dental Care utilizes state of the art dental equipment to provide our patients the best care possible. 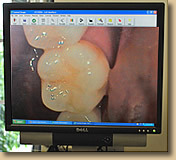 One of the many ways the Limerick Dental Care utilizes state of the art technology is our digital imaging system. There are many benefits to digital radiography, but the most important is our patient’s safety. Digital imaging reduces radiation to the patient by up to 90%. 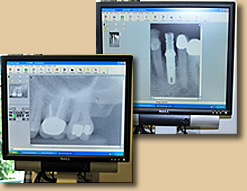 With digital x-rays, a full-screen image is displayed on a flat-screen monitor right next to the dental chair. The associated software allows the doctor to show patients different aspects that can’t be shown using traditional film x-rays, and the patient comes away with a better understanding of their dental health. Images are then stored electronically, making them readily available in the future, allowing the doctor to demonstrate changes over time. Digital imaging technology is also good for the Earth. The use of digital imaging technology eliminates the need for the toxic chemicals and lead foil used with traditional x-ray films. We have recently added a Digital Panoramic x-ray machine to our practice. 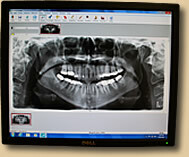 This state of the art machine allows us to capture a digital imagine of your entire mouth with just one x-ray. This imagine allows us to see your 3rd molars ("wisdom teeth") and developing teeth on a young patient. Our new Panoramic X-ray machine uses the lowest radiation exposure that will allow safe and accurate diagnostic quality imaging. This machine is invaluable for a patient who has a difficult time with traditional dental films. Limerick Dental Care can also provide patients with gentle, non-surgical gum treatments. Everyone has plaque and bacteria in their mouths, but some bacteria lead to periodontal problems. we have a microscope to review your plaque and we can determine the type of bacteria you have present around your teeth. When treated early, periodontal problems can be controlled much more easily. Another tool we have available to help treat your dental needs is an intra-oral camera. This device allows the patient to see on the computer monitor, exactly what the doctor sees. Pictures truly do speak louder than words and these images help our patients understand what is occurring in thesir mouths. Contact us today to learn more or schedula an appointment!